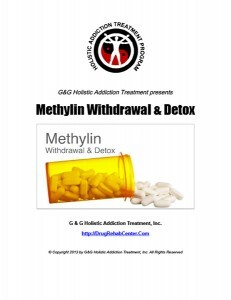 Methylin Withdrawal and Methylin Detox are discussed in this Special Report. Methylin is used as part of a treatment program to control symptoms of attention deficit hyperactivity disorder, commonly known as ADHD which includes difficulty focusing, controlling actions, and remaining still or quiet. Methylin is used also to treat narcolepsy which is the sleep disorder that causes excessive daytime sleepiness and sudden attacks of sleep. Methylin is in a class of medications called central nervous system stimulants. It works by changing the amounts of certain natural substances in the brain. When Methylin is used chronically and in sufficient quantities a person will become dependent on Methylin and will experience withdrawal symptoms upon cessation of use. Withdrawal symptoms may dissipate in a matter of weeks or may endure for months. What are the withdrawal symptoms of Methylin? The withdrawal symptoms of Methylin include: being extremely tired, depression, sleep disorders, dizziness, shakiness, headache, diarrhea, constipation, dry mouth, and impotence. When Methylin use is stopped abruptly these withdrawal symptoms can be severe. Persons who are addicted to Methylin usually enter a substance medical detox in which the withdrawal effect and symptoms can be minimized at a safe and steady pace under the supervision of a medical doctor. This kind of medical drug detox program has been proven safer, faster, and more comfortable than many other systems.